Note: You can do the in-lab portion (parts I through V) with a partner if you wish. The homework (parts VI through VIII) must be done individually. Place the robot on the desktop facing sideways (away from the edge). Hide the cubes behind the robot so he can't see them. Make sure the robot is in radio contact with the cubes even though he can't see them. Type "cube1" in simple_cli and it should show up. Make sure the robot is talking to your cubes and not someone else's. Type "show viewer" in simple_cli so you can see what the robot sees. He should not be seeing any cubes! What is cube1's initial pose? What about cube2 and cube3? Type cube1.pose.is_valid. What do you get? Place cube1 (the "paperclip") in front of the robot so he can see it. What are cube1's x,y,z coordinates and origin_id now? Use your hand to block the robot's eyes and shift the cube slightly. Keep your hand there so the robot can't see it. What are cube1's x,y,z coordinates and origin_id now? Is the cube visible? Quickly pick up the robot by grabbing and lifting him so that his camera points toward the ceiling. Wave him around a little. Put the robot down facing away from you, so that cube1 is about 6-7 inches off his right side and he can't see it. What are the robot's and cube's poses and origin_id now? In simple_cli do Turn(-90).now() so that the robot is now facing the cube and can see it. What are the robot's and cube's poses and origin_id now? Pick up the robot and wave him around again, then put him back facing away from you, like before. What are the robot's and cube's poses and origin_id now? Now pick up the cube, wave it around a bit, and put it six inches behind the robot, not off its right side. What are the robot's and cube's poses and origin_id now? Do Turn(-90).now(). The cube should be off the robot's right side and still out of sight. What are the robot's and cube's poses and origin_id now? Do Turn(-90).now() again. The robot should now see the cube. What are the robot's and cube's poses and origin_id now? Pick up the robot, wave him around, and put him back down in a position where he can see the cube. What are the robot's and cube's poses and origin_id now? In simple_cli, type robot.kine.joints to see the joints. Type show kine to see the robot's kinematic tree. This is just a nicely formatted version of robot.kine.joints. Examine the source code in ~/cozmo-tools//cozmo_fsm/cozmo_kin.py. This file creates the kinematic description of the robot using the Denavit-Hartenberg conventions discussed in lecture. Study how the shoulder joint relates to the base frame, and the lift_attach joint relates to the shoulder joint. Type show kine shoulder to see the shoulder joint, which controls the lift. Also look at show kine lift_attach. Examine the results of the following expressions. Pay particular attention to the fourth column of each matrix. By experimentation, find the lift height that gives a shoulder joint angle close to 0 degrees. Note that you will not be able to use SetLiftHeight to make tiny changes in the lift height; such requests are ignored. So to change the lift height from 0.1 to 0.15 you should first do SetLiftHeight(0.6).now() and then SetLiftHeight(0.15).now(). Recompute the difference sj[0,3] - laj[0,3] with the shoulder angle now roughly 0 degrees. What value do you get? Raise the lift by doing SetLiftHeight(1).now(). Then recompute sj and laj. Note that pt_base is in homogeneous coordinates. A joint's reference frame does not rotate as the joint angle changes. The angle is actually measured relative to that reference frame. But the link reference frame does rotate with the joint. Why are the translation values (last column) the same? Why are the translation values (last column) different? The joint_to_base and base_to_joint transformation matrices are inverses of each other, as are the link_to_base and base_to_link matrices. What result does the following produce? We can use np.linalg.inv() to invert a matrix. What result does the following produce? 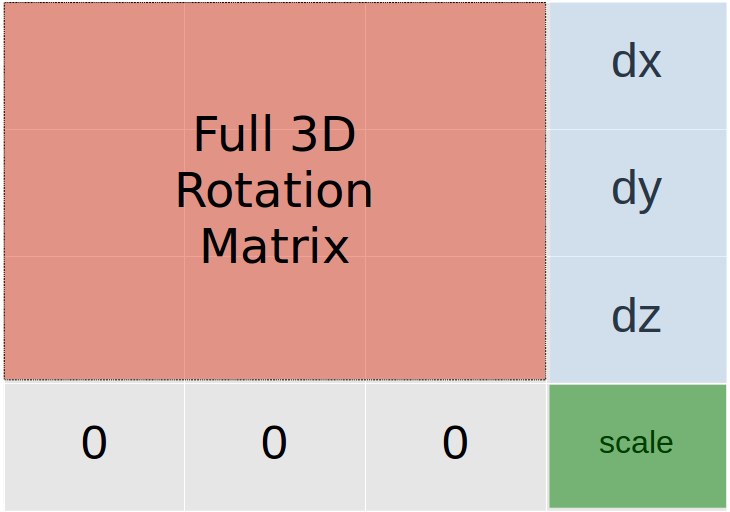 A single DH transformation matrix is sufficient to convert any reference frame orientation to any other orientation, but it cannot always reposition the origin of the new reference frame at the same time, since this would require six degrees of freedom but there are only four DH parameters. What trick did we have to use to get the camera reference frame set up so that both its orign and orientation are correct? This is the end of the in-lab portion. Please hand in your completed worksheet before leaving. Note: The homework problems (parts VI through VIII) must be done individually. left_front_wheel and right_front_wheel: the z axis for each wheel should point outward, away from the robot's centerline. The x axis should point forward. left_hook and right_hook: these are the hooks on the lift. The z axis should point up and the x axis should point forward. You may need to use a trick like we did for the camera frame. Suppose we have an object that is 100 mm in front of the camera's focal plane, and we want to know how far forward of the front axle it lies. If the head is tilted up, the object will not be as far forward as if the head is pointing straight horizontal. Write a function to calculate the answer using transformation matrices. Then write a program to move the head through a range of head angles (-10, 0, +10, +20, +30, and +40 degrees) and print the answer for each head angle. Write down your results and include them with your hand-in. This is a simple IK problem. Given an object of height h at position (x,y) in base frame coordinates, write code to point the camera directly at the top of the object. First you should turn to the correct heading. Assume this can be done without error. Then you must set the head angle so that the center of the camera (the z axis in the camera reference frame) points directly at the top of the object. Note that the camera and head joint reference frames are different, so you must be careful with your coordinate transformation. Write a program to do this. Take an object of known height, place it at a known position relative to the robot, and run your program. Try different distances and heights. How accurately is the top of the object centered in the camera image? Collect all your homework code and results in a zip file. Hand in your work through AutoLab by next Friday.